Kent Schoen and Karel Baloun became friends when they were both employed by Looksmart, an early web look-up service. Today, over a decade later with stints at other companies and startups including a lucrative stop at Facebook (s FB), they are back working together at Leap Commerce, a San Francisco-based company that is the force behind Best Decision, a mobile shopping app. 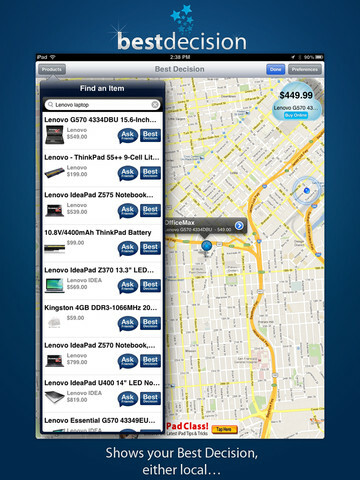 The company today is releasing a new version of their app for the iPad and the iPhone. Baloun, who joined Facebook in 2005, left the social network in 2006 to start his own company. In 2011, he teamed up with CEO Amit Chatterjee, one of his high-school friends and a serial entrepreneur, to co-found Leap Commerce. Schoen, who left Facebook in 2011, was an early investor in the company and subsequently joined the company. The company started working on the platform last year and released an early version of Best Decision a few months ago. Since then it has steadily upgraded the app and added more features. Best Decision is an app that allows you to shop for products that are available with your local merchants (via data from sources such as eBay’s Milo) in addition to online merchants’ databases. For instance, you could look for shoes or jeans and get results from Amazon, Wal-Mart, Gilt and ShopStyle. It allows you to ask for opinions from your friends and then make a purchasing decision. Now if you downloaded the app and just went by the looks, it isn’t something to write home about. However, if you use it for doing some shopping, you will quickly find it pretty useful. I would love to see the company improve the user experience and make the app more visually attractive, but the real story of this company is the platform developed by Baloun and his cohorts. And it is one of the reasons I was interested in not only knowing more, but actually writing about these guys. “Commerce has matured with the Internet,” says Schoen, vice-president of product with the company. “While big-box retailers are okay when it comes to offering their catalog online, it is hard to tell what is available at your local stores.” In addition to finding local inventory, it is hard to sift through information to make a quick and smart buying decision. That is the primary motivation behind the company, said Leap Commerce co-founder Baloun. The Best Decision app is based on Best Decision shopping recommendation engine that Leap Commerce hopes to license via an API and a SDK to other app developers. Schoen points out that the app is a showcase for their platform. In the future, they not only want to offer results, but also integrate with services such as TaskRabbit and Postmates, so that you can not only order but also have goods delivered from your local stores. Pay with Square is another option the company can add to its platform. From my perspective, this is a company that would make an ideal acquisition for someone like Pinterest (or Yahoo, now that we have a product-centric CEO in charge of that company). All of those reasons and the fact that they will integrate more services into their platform. Looks like this company is filling a niche to help consumers identify products of interest that are actually on hand at local merchants as well as to access product recommendations. We applaud any improvements in ecommerce that help to empower consumers and that is what we are doing with our crowd purchasing platform at flashpurchase.com which helps to democratize commerce.